Truck Replacement Program: The District is currently accepting applications to replace on-road diesel trucks with cleaner technology units or to expand fleets with the cleanest technology available. Public Benefit Grant Program: This program provides funding for the purchase of new alternative fueled vehicles (Electric, Plug-In Hybrid, CNG, LNG, LPG, etc). Applications for this component are currently being accepted on a first-come, first-serve basis. Alternative Fuel Mechanic Training: Eligible educational subjects include the following: alternative fuel engines, fueling practices and vehicle fuel systems, fuel station components, operational safety and procedures, technical or mechanic training, or alternative fuel technology overview. Hybrid and Zero-Emission Truck and Bus Voucher Incentive Project (HVIP): HVIP was formed as a result of the Air Quality Improvement Program (AQIP). AQIP offers funding for projects and initiatives focused on supporting the development and deployment of the advanced technologies needed to meet California’s longer-term, post-2020 air quality goals. By offering point-of-sale incentives for clean trucks and buses, HVIP provides a streamlined approach for providing helpful incentives to fleets without waiting to submit proposals or complicated paperwork. Fleets receive the voucher discount at the point of sale while HVIP-approved vendors and dealers process the required documentation. For a complete list of conversion systems approved and certified by the Environmental Protection Agency (EPA) and California Air Resources Board (CARB), visit NGVAmerica’s Vehicle Availability. This list covers light- and heavy-duty natural gas vehicle options. 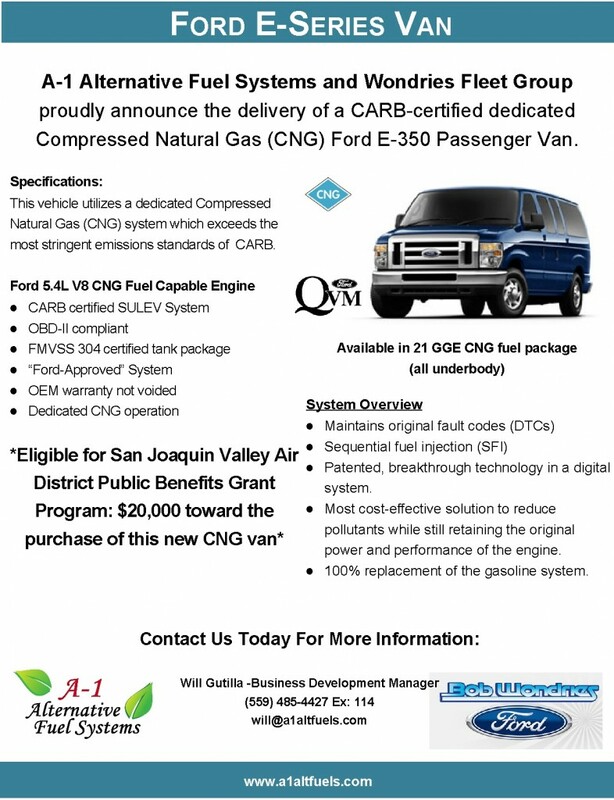 A-1 Alternative Fuel Systems and Wondries Fleet Group have CNG-powered Econoline Vans available for sale in Fresno.